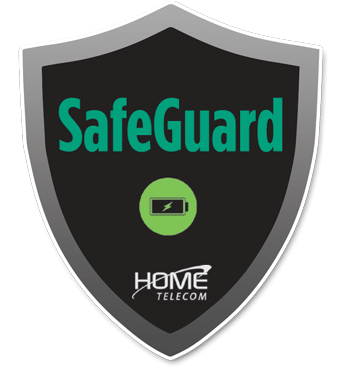 Home Telecom’s SafeGuard Plan is an optional program that provides diagnosis and repair of inside wiring and jacks used with the telecommunication services (telephone, internet, video) provided by Home Telecom as well as covers the monitoring and replacement of Home Telecom installed backup batteries for a small monthly fee. “Inside Wiring” means the wiring within your home up to the point where it connects to the Optical Network Terminal (ONT), Network Interface Device (NID) or house protector. Labor and materials for a Home Telecom technician to perform diagnostic work to determine the location of the problem and make repairs to the inside wiring and jacks for telecommunication services (telephone, internet, video) offered by Home Telecom. Remote monitoring of the status of backup batteries used with Velocity telephone or Digital Voice telephone service and replacement of said batteries when needed. Why should I sign-up for SafeGuard? A typical service call without SafeGuard is $25.00. This cost covers only troubleshooting. 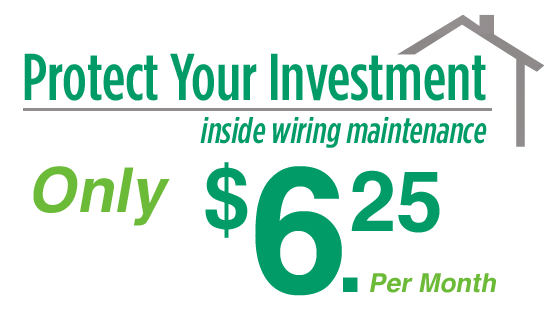 If the problem is found to be with your inside wiring, a minimum of $75.00 is charged for repair. Home Telecom’s SafeGuard will cover the cost of the service call as well as the repair when you have a problem with the wiring or jacks inside your premises. Additionally, if you have Home Telecom Velocity telephone or Digital Voice telephone that utilizes a backup battery, Home Telecom will monitor the status of the battery and replace it for you when needed. The backup batteries for Velocity telephone and Digital Voice telephone are $50.00 and $25.00, respectively. For only $6.25 per month, SafeGuard provides relief from service call charges and ensures that you will have backup power for your telephone service in the event of a power outage. The SafeGuard Plan takes effect immediately upon enrollment. The SafeGuard Plan has a minimum commitment of 12 months. A $50.00 early cancellation charge will apply if the plan is terminated within the 12 month period. After the initial 12 months, the plan renews on a month-to-month basis and may be cancelled at any time. Customers in apartments, condos and other multi-unit housing must consult with their residential management or landlord prior to ordering the SafeGuard Plan to determine if Home Telecom’s technicians are permitted to repair inside wiring or jacks in the customer’s dwelling.